This week brought a huge pile of books. Well, actually, it only brought five books, but one of these is massive and another is also unusually long so it looks like a large pile of books. Four were ARCs and review copies and the other was a purchase influenced by one of the review copies that showed up. 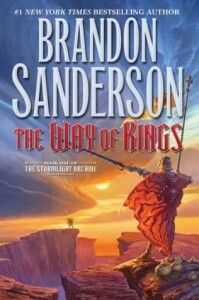 Words of Radiance, following the New York Times bestselling novel The Way of Kings, will be released on March 4 (massive hardcover, ebook, audiobook). The book tour dates and locations are listed on Tor.com if you want to find out if there is an event near you. 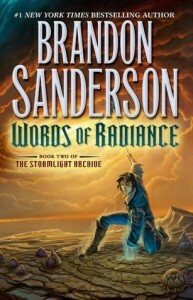 Some excerpts from Words of Radiance can also be read on Tor.com. This books is HUGE. It’s almost 1100 pages in hardcover. I wasn’t really planning to buy it quite yet, but the first book of The Stormlight Archive was on my wish list, and I bought it after the second book appeared in my mailbox. Since I was sent a hardcover, I needed another massive hardcover to match because I’m like that, and I saw there were only 11 copies left on Amazon as bargain books. With the second book coming out soon, I was afraid that would be the end of the hardcover copies so I bought one while I could (and was a little dismayed that it didn’t match as well as I’d hoped since it’s not quite as tall as the second book, but oh well, it’s closer to matching than the paperback would have been). An excerpt from The Way of Kings can be read on Tor.com. 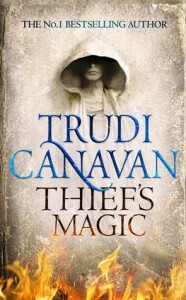 Thief’s Magic, written by Aurealis Award winning and Sunday Times bestselling author Trudi Canavan, will be released in May (hardcover, ebook, audiobook). The next two books in the trilogy, Angel of Storms and Successor’s Son, are scheduled for release in 2015 and 2016. In a world where an industrial revolution is powered by magic, Tyen, a student of archaeology, discovers an sentient book in an ancient tomb. Vella was once a young sorcerer-maker, until she was transformed into a useful tool by one of the greatest sorcerers of history. Since then she has been gathering information, including a vital clue to the disaster Tyen’s world faces. Elsewhere, in an land ruled by the priests since a terrible war depleted all but a little magic, Rielle the dyer’s daughter has been taught that to use magic is to steal from the Angels. Yet she knows from her ability to sense the stain it leaves behind that she has a talent for it, and that there are people willing to teach her how to use it, should she ever need to risks the Angels’ wrath. Further away, a people called the Travellers live their entire lives on the move, trading goods from one world to another. They know that each world has its own store of magic, reducing or increasing a sorcerer’s abilities, so that if one entered a weak world they may be unable to leave it again. Each family maintains a safe trading route passed down through countless generations and modified whenever local strife makes visiting dangerous. But this is not the only knowledge the Travellers store within their stories and songs, collected over millennia spent roaming the universe. They know a great change is due, and that change brings both loss and opportunity. Tor Books is publishing NASA-Inspired Works of Fiction to advance interest and education in STEM fields. 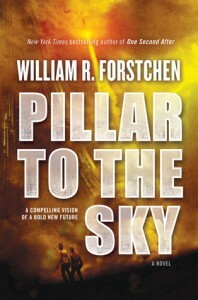 The first of these books, Pillar to the Sky, was released in February (hardcover, ebook, audiobook). An excerpt is available on Tor.com. This journey to the stars will not be easy—a tumultuous struggle filled with violence and heroism, love and death, spellbinding beauty and heartbreaking betrayal. The stakes could not be higher. Humanity’s salvation will hang in the balance. 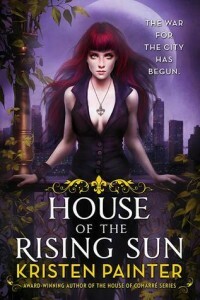 The first book in a new series by the author of the House of Comarre books will be released in May (paperback, ebook).